Detail from one of the boards displaying portraits of Great War medal winners. AALZ 902 61, Archives New Zealand. Portraits of medal winners collected by the Dominion Museum were framed in groups like this one. In the centre is Brigadier-General Bernard Freyberg. Freyberg received a ‘Distinguished Service Order in Gallipoli Campaign for a brilliant personal exploit, involving hours of solitary swimming at sea. Awarded V.C. for conspicuous bravery at the Battle of Ancre’. AALZ 902 item 20, Archives New Zealand. 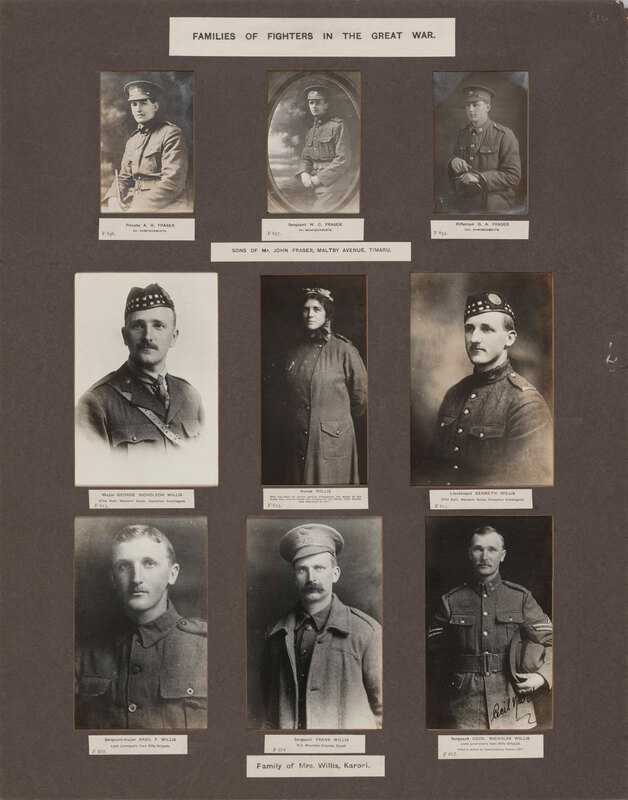 To track down portraits for the collection Thomson began by appealing directly to the next-of-kin of medal winners for photographs of their relative in uniform. Unstinting approval for the scheme was the norm. Mrs G. E. Simon, the sister of Edward Freed (who won a Military Cross at Messines) received one of the first requests from Thomson in mid-July 1917. 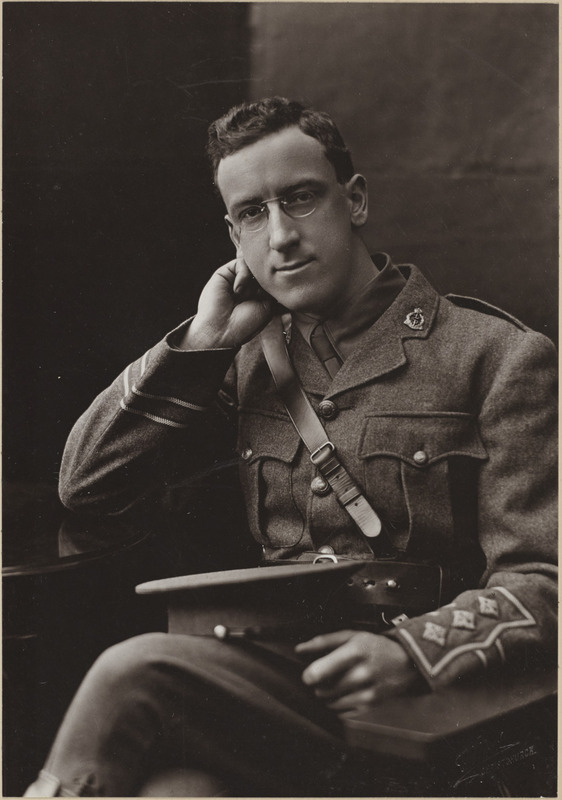 Thomson informed Mrs Simon that portraits of New Zealand servicemen like her brother, ‘whose conduct has marked them out for distinction by their King and Country’, were being ‘secured in readiness’ for when they could be ‘fittingly displayed’ in a separate war museum. [iv] This overall objective impressed Mrs Simon, who promptly posted a photograph to Wellington. Captain Joseph K. Venables received his Military Cross ‘for courage and coolness on Active Service in France. Died of wounds in France.’ AALZ 25044 1/F719, Archives New Zealand. It was unavoidable that some photographs depicted medal winners who had died, like Charles Senior, while on active service. However, this collection worked differently from imagery that the bereaved saw in other contexts, in that it presented an uplifting and heroic side to the war. And, collectively, the soldiers personalised and personified qualities, such as courage, gallantry and bravery, that were universally admired and aspired to. 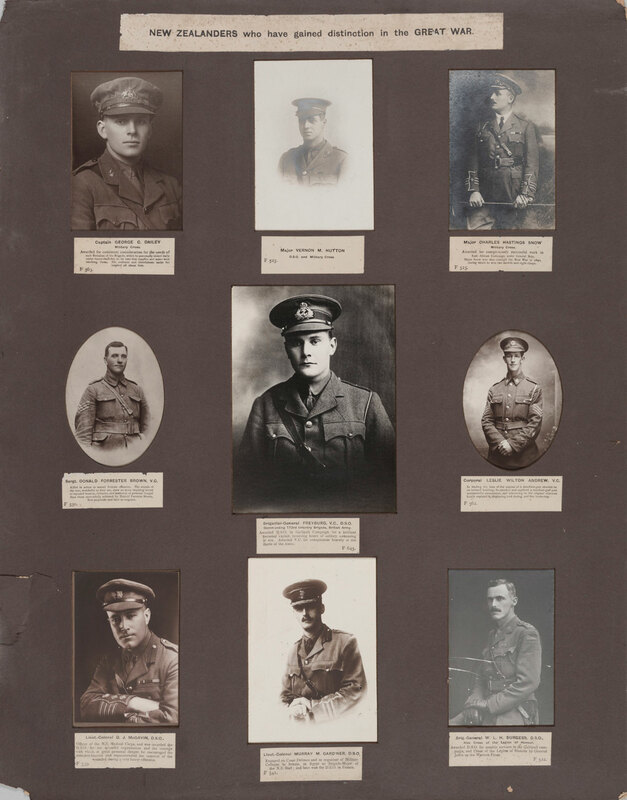 This group of portraits features three ‘sons of Mr John Fraser, Maltby Avenue, Timaru’ who served in the NZEF (top row) and six members of the ‘Family of Mrs Willis, Karori’. The Willises served across the Empire, in Canadian forces as well as the NZEF and New Zealand Army Nursing Service. AALZ 902 item 5, Archives New Zealand. 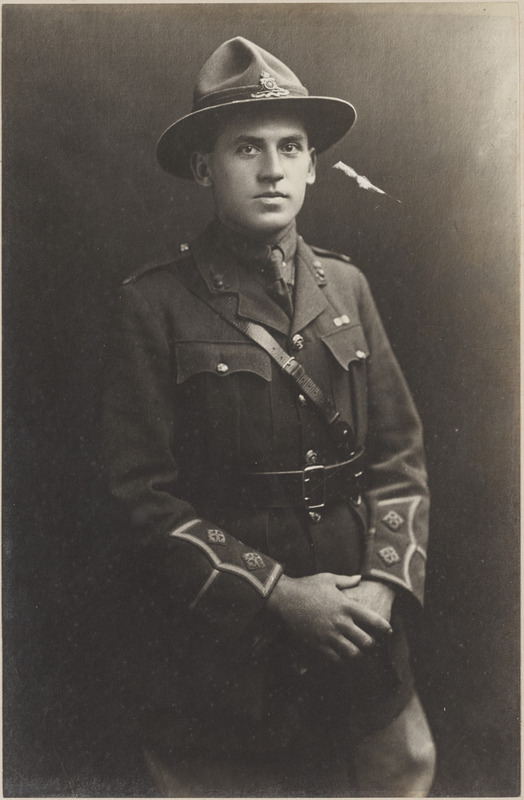 Captain Louis Noedl ‘enlisted as a Private in Sydney in the early part of 1915. Won the Military Cross in France 1916 and the Distinguished Service Order for conspicuous gallantry in making a reconnaissance for and directing the construction of urgently needed bridges across the Somme under exceptionally heavy fire. Captain Noedl is of Hungarian descent and his grandfather fought under the British flag and lost his life in The Crimean War.’ AALZ 25044 2/F110, Archives New Zealand. Although each portrait carried particular sentimental meanings for friends and family, Thomson’s goal was to create from them a collection that was national in character. However, he applied the prevailing, capacious notion of ‘national’ identity – one in which New Zealand and Dominion identities co-existed under the umbrella of the British Empire. The collection therefore included NZEF medal winners, New Zealand-born or not, as well as New Zealanders who won their awards in other imperial forces including, for example, Victoria Cross winner Bernard Freyberg. Captain W. McKail Geddes received his Military Cross ‘for exceptional courage in reconnoitring enemy country under heavy shellfire. 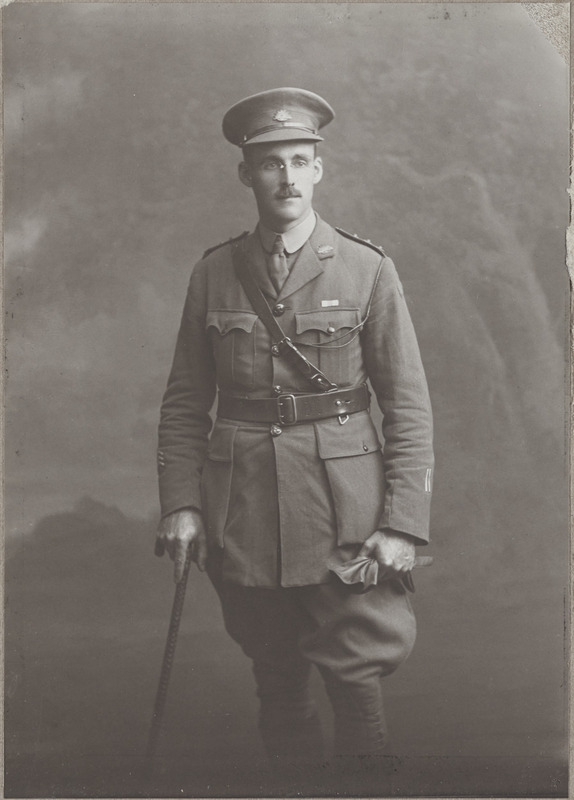 He was enabled to send back information of great value to his Brigade while his daring and resourcefulness contributed greatly to the success of our artillery.’ AALZ 25044 6/F747, Archives New Zealand. The first framed groups of portraits were hung in the Dominion Museum at the beginning of 1918. Apart from a handful that celebrated ‘Families of Fighters in the Great War’, these were unsystematic groupings of assorted medal winners. This lack of order was of little consequence to visitors and the portraits’ meaning: En masse, they were the personal and public means though which the viewers appreciated, reconciled and were reminded of the complex concurrent meanings and emotions generated by the war. Despite its popularity, Thomson’s scheme to collect privately-held photographs of medal winners of all ranks, and then to display them in public, was short-lived. In fact the precise date of the portrait gallery’s demise mattered so little that it appears to have gone unrecorded. That it was wound up without comment suggests that the portraits had run their course as a focus for war-related reflection. On the other hand, increasingly through the 1920s, Anzac Day and community war memorials became primary media for public remembrance, the time and places utilised by for most New Zealanders to observe the ongoing impact of the Great War. Yet it is appropriate that during the war’s centennial, we review the photographs described above, and the motivations behind their collection for and donation to the museum, so that we can see them in relation to these dominant ways of remembering the First World War. [i] For further details see Kirstie Ross, ‘“More the books can tell”: Museums, Artefacts and the History of the Great War’, in Katie Pickles et al, eds, History: Making a Difference, Cambridge Scholars Publishing, Newcastle upon Tyne, 2017, pp. 224-48. [ii] Evening Post, 17 March 1917, p. 6. [iii] The photographs are in two series: AALZ 902 and AALZ 2504, Archives New Zealand. Correspondence related to the photographs is in AALZ 907. [iv] Thomson to Mrs G. E. Simon, 13 July 1917, AALZ 907 box 7, Archives New Zealand. [v] Mrs Greenish to Thomson, 30 August 1917, AALZ 907 box 7, Archives New Zealand. Greenish’s portrait appears on AALZ 902 item 41. [vi] Mrs E. G. Seton to Thomson, 5 January 1920, AALZ 907 box 14, Archives New Zealand. Seton’s portrait appears on AALZ 902 item 63. [vii] Oliver Senior to Thomson, 5 May 1920, AALZ 907 box 14, Archives New Zealand. Senior’s portrait appears on AALZ 902 item 71. [viii] Tom Parsons to Thomson, 15 August 1920, AALZ 907 box 13, Archives New Zealand. [ix] Joseph Ward to Thomson, 6 October 1920, AALZ 907 box 14, Archives New Zealand. [x] Mrs C. Venables to Thomson, 31 March 1918, AALZ 907 box 16, Archives New Zealand. Venables’ portrait appears on AALZ 902 item 25. [xi] Robert Noedl to Thomson, 14 February 1919, AALZ 907 box 13, Archives New Zealand. Noedl’s portrait appears on AALZ 902 item 42. [xii] Observer, 2 December 1904, p. 4. [xiii] Mary Geddes to Thomson, 1 October 1917, AALZ 907 box 7, Archives New Zealand. Geddes’ Scottish grandfather William Webster arrived in New Zealand in 1839. In 1850, he married Annabella (Hanapara) Gillies whose mother was Ngāti Toro. Jennifer Ashton, At the Margin of Empire: John Webster and Hokianga 1841-1900, AUP, Auckland, 2015, p. 99. Geddes’ portrait appears on AALZ 902 item 27.